A delicious, mix of slow and fast release protein, infused with raspberry and acai powder, sweetened naturally with stevia. Super Protein Raspberry & Acai Diet is great as a shake or a delicious protein boost as and when required. It’s also a great way to enhance everyday baking recipes such as pancakes, muffins, brownies and more. Take one serving after exercise or as and when you require a delicious protein boost. 1 serving = 1 x 30g (sachet). Mix with 200ml of water, milk or in a smoothie. Calcium caseinate (milk), whey protein concentrate (contains emulsifier: non-GM soya lecithin) (milk), raspberry powder (3.0%), conjugated linoleic acid (CLA), acai extract (1%), l-carnitine, flavouring, stabiliser (carboxymethyl cellulose), sweetener (steviol glycoside), raspberry ketones. Do not exceed the maximum daily intake. Supplements should not replace a varied and balanced diet and a healthy lifestyle. Store in a cool dry place out of reach of children. This product is derived from milk. Contains dairy. This product is manufactured in a plant that processes ingredients containing the following: dairy, corn, soya, oats, wheat, egg, celery, sulphites, fish, crustacean and nut products. Cannot guarantee nut free. 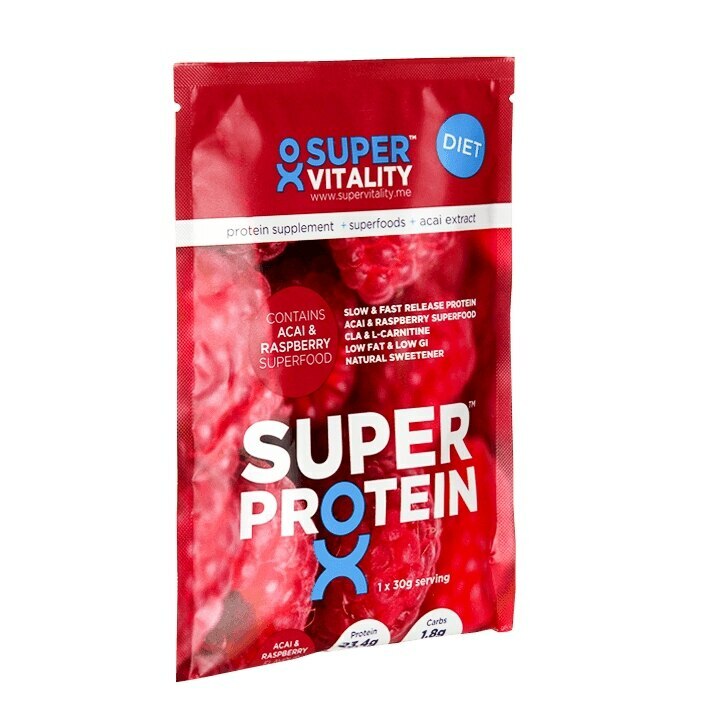 Super Protein Raspberry & Acai Diet is rated 5.0 out of 5 by 1. Rated 5 out of 5 by Jusweelou from Super protein It's definitely super ! This was my first time using this shake I bought it as it was on offer & am so glad I did . It was a delicious taste as am used to Herbalife I thought I wouldn't like this but I was proved wrong & the energy I got was unbelievable I loved it that much I bought more straight away although I have to wait till new stock come in but loved it !